Charlotte Sharman Primary School, located in the heart of Elephant & Castle, has a large playground, but with only a few potted plants and some little-used play equipment, they have recently been looking for ways to promote healthy lifestyles for their pupils. We are therefore excited to announce that Trees for Cities, with funding from players of Peoples Postcode Lottery, will now transform areas of the school playground at Charlotte Sharman Primary School in Southwark into an edible playground. The edible playground – built in the school playground – will give the pupils the opportunity to grow fruit and vegetables and learn why healthy eating is important. As well as enriching the pupils learning experience, it will also enable the teachers to teach across their broad and creative curriculum in an engaging outdoor space. David Elliott, Chief Executive at Trees for Cities said “With 37 per cent of children between ages of 5 – 12 not eating enough every day and 20 per cent obese on leaving primary school, more and more schools are now educating their children on how food is grown and on making healthy eating choices”. As part of the project, the pupils will also enjoy hands-on cooking lessons from Chefs Adopt a School and access to food education programmes outside the school gate via charity School Food Matter’s Membership for Schools. 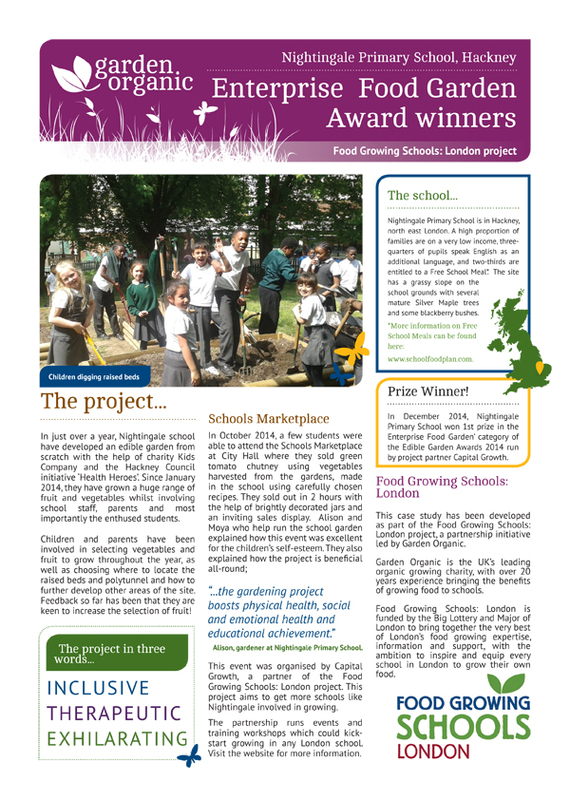 School Food Matters will also support Charlotte Sharman Primary to achieve their first Food for Life Award. The edible playground will be completed by April after which there will be a launch event to celebrate their fantastic new garden.